Which web browsers and devices can be used to stream Superbook Academy videos? Use AppleTV, Google Chromecast or an HDMI cable to connect your mobile device or computer to a large-screen TV to play the videos. Streaming Superbook Academy works with many different levels of broadband, so the speed and bandwidth of your Internet connection may impact your viewing experience. Also, the number of devices connected to your broadband can impact your internet speed. High Definition videos use more bandwidth than lower quality videos. Are the videos streamed in High Definition (HD)? Yes, High Definition (HD) provides the best picture and audio experience for the videos. However, we also support Standard Definition and lower quality versions for devices and platforms that cannot play HD content. I am having technical issues with streaming Superbook Academy videos on a particular web browser/device. Can you help me? Please contact our Technical Support Team for assistance at 0300 561 0700, or complete the Contact Us form by clicking here Contact Us. 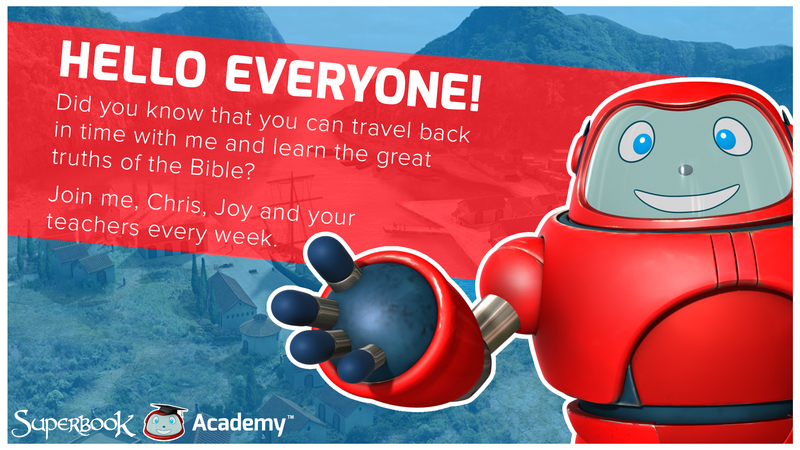 My church does not have Internet access; can we still use Superbook Academy? DVDs for all courses are available for purchase within the subscription account management portal or the Academy dashboard. Note that the DVDs include videos only, and do not have the Leader Guides, printable crafts, and other supplemental resources that are only available online. I already own the regular Superbook DVDs. Can I just purchase the Superbook Academy materials and not the videos? Original music videos, and more. How do I subscribe to Superbook Academy? 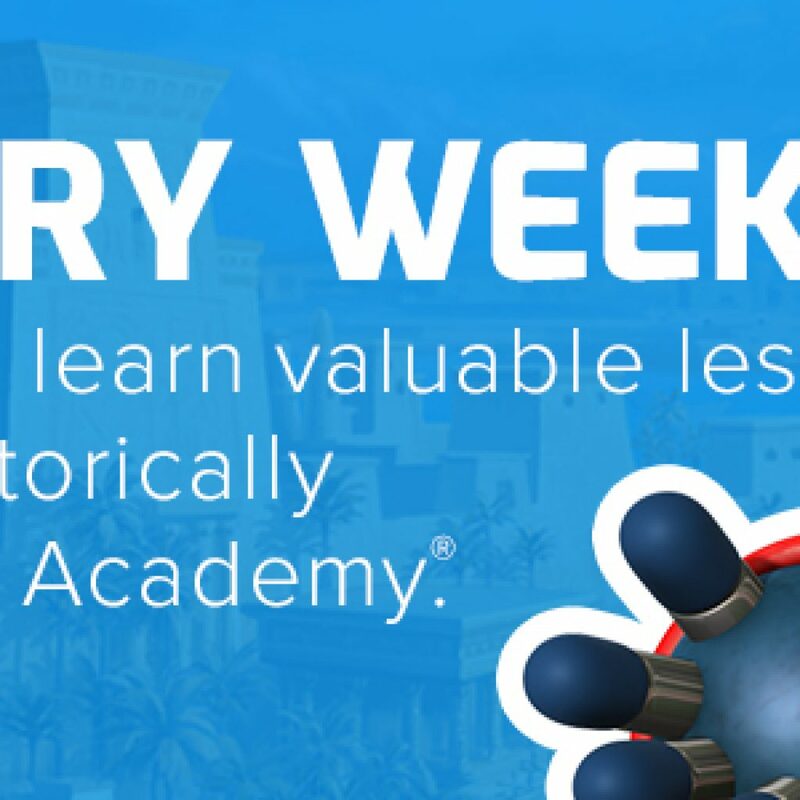 All Superbook Academy courses are available instantly online for a monthly subscription of £15, or an annual subscription of £130 — which is a savings of £50 per year. Subscribe now by clicking here. Superbook Academy is a multiyear Christ-centred Sunday School resource that focuses on stories from Genesis through Revelation. Each course focuses on one Bible story and includes three lessons. Lesson 1 identifies the primary Bible message in the episode. A Discipleship Challenge (practical application) is introduced to help children personalise and incorporate scriptural principles into their everyday lives throughout all three lessons of the course. Lesson 2 focuses on the message as it relates to the world both historically and today. Lesson 3 highlights how the message ultimately comes full circle in God’s plan of sending His Son, Jesus Christ, to be our Saviour. Each course in Superbook Academy includes a set of three lessons focused on one Bible story, complete with videos and teaching materials. Each of the three lessons can last from 60 to 90 minutes, depending on class time available. What happens in Large Group for each of the three lessons in a course? Lesson 1: Children are introduced to the SuperTruth, which is the lesson’s theme. They see a short introductory video where Chris, Joy and Gizmo—the modern-day characters in Superbook—face a dilemma to which any child can relate. After a brief discussion, the full Superbook Bible video is shown, followed by the introduction of the SuperVerse, a prayer, and dismissal to Small Group. Lesson 2: Children view the Condensed Bible Story, a music video, plus a Bible Background video exploring the archaeological, historical and cultural context of the story. Students are also introduced to the SuperTruth and SuperVerse for the lesson before praying and going to Small Group. Lesson 3: Children view the Condensed Bible Story, the Salvation Poem video, and a Signposts video showing how the story points to Christ, or how He fulfilled biblical prophecy. Students are also introduced to the SuperTruth and SuperVerse for the lesson before praying and going to Small Group. What is taught in Small Group for each lesson? If you have additional class time or wish to change any parts of the main lesson for Small Group time, you may choose from alternative options in the Additional Activities Leader Guide. These include extra games, object lessons, crafts and Bible studies that can take up to an additional 30 minutes of class time. No videos are shown during Small Group. Each lesson includes Large Group and Small Group. Additional Activities are optional. Large Group (for Grades 1-6 combined): about 30 minutes. Small Group (for Grades 1-3 and 4-6): about 30 minutes. Additional Activities (extra games, object lessons, crafts, and Bible studies if you have extra class time): up to 30 minutes. Combined, all of these provide materials for up to 90 minutes. If you have less than an hour for class, you may easily trim an activity. Will I need to find or purchase lots of extra materials for games and lessons? 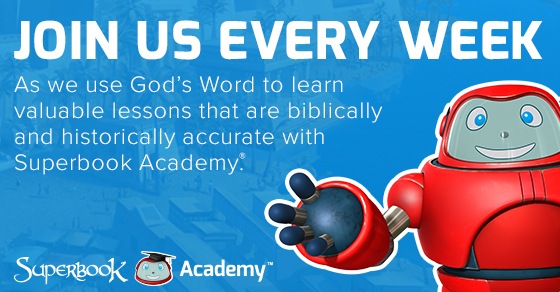 Superbook Academy is designed to be used by churches of all sizes around the world—so the materials needed for games and lessons are quite simple. You can probably find most of them in your kitchen pantry or your church’s broom closet! Plus, the Leader Guides feature beautifully designed crafts, posters, and other supplemental materials that are quick to print and will help make the lesson more meaningful for your students. What is the difference between the Superbook Academy and the regular Superbook DVDs? Superbook Academy church curriculum is specially designed for churches and children’s ministries to dig deeper into the exciting Bible stories that are presented in Superbook episodes. 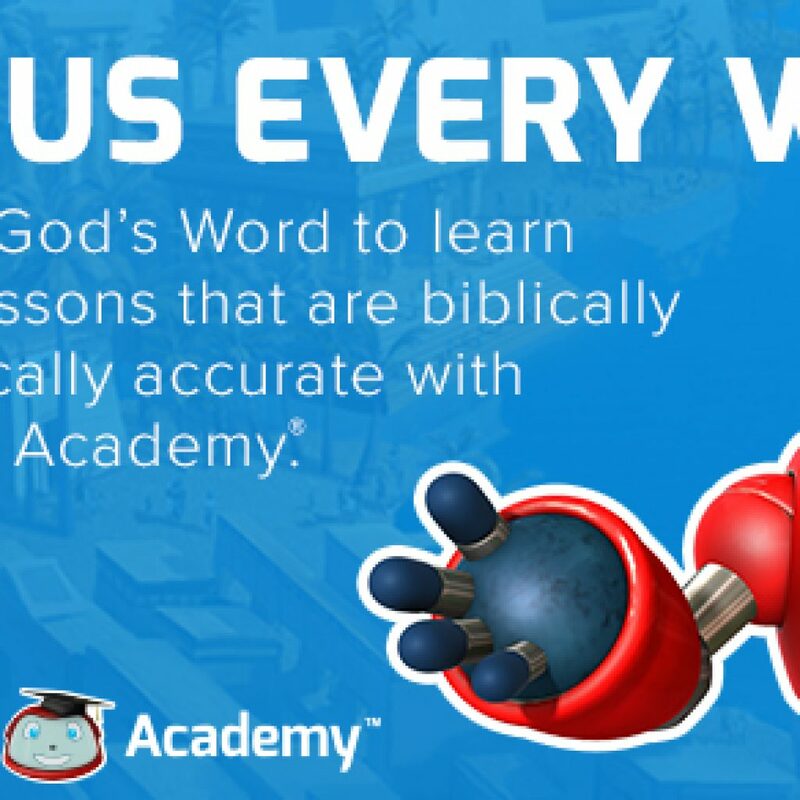 Each Superbook Academy course is based on one Superbook episode and also features other videos that are exclusive to Superbook Academy—such as the Bible Background video, Signposts video, The Salvation Poem (Gospel presentation) video, music videos, and more. Every course includes three full lessons—each lasting from 60 to 90 minutes—with Leader Guides featuring easy-to-follow scripts for Large Group, Small Group, and Additional Activities. What is the general format for each lesson? Large Group: The opening celebration for ages 6-11 combined features the welcome, presentation of all videos for the lesson, introduction of the SuperTruth (lesson theme) and SuperVerse (Bible verse), and prayer. Large Group lasts about 30 minutes. Small Group: Children may divide into classes for Years 2 – 4 and 5 – 7. (If the combined group is small, all children may stay together for Small Group time.) Here, children explore the lesson through creative games, object lessons, crafts, Discipleship Challenges (encouraging children to put God’s Word into practice), group activities to learn Bible verses, and guided prayer time. No videos are shown during Small Group time. Each Small Group Leader Guide includes material for about 30 minutes of class time. Additional Activities: If you have additional class time or wish to change any parts of the main lesson for Small Group, you may choose from alternative options in the Additional Activities Leader Guide. These options include extra games, object lessons, crafts, and Bible studies that together can take up to an additional 30 minutes of class time. Where can Superbook Academy be used? Superbook Academy is geared to keep the attention of today’s media-savvy kids. It is perfect for Sunday school, church school, Bible clubs, and midweek gatherings, and it’s also easily adaptable for vacation Bible school, homeschool, community outreaches, and other special events. The curriculum is well suited for churches of all sizes. What ages are included in Superbook Academy? Superbook Academy church curriculum is designed for children aged 6-11. All children stay together for Large Group, the opening celebration. After Large Group, they may divide into Small Group classes for Years 2 – 4 and 5 – 7. Some smaller churches opt to keep all students together for both Large and Small Group. Superbook Academy church curriculum is a multiyear Bible study program for children aged 6-11, based on the Emmy-nominated Superbook Bible animation series. It is designed for children’s ministries such as Sunday school, children’s church, and Bible clubs; and is easily adaptable to individual needs, such as VBS, homeschool, midweek services, and special events. This dynamic combination of Superbook’s world-class animation and curriculum provides churches with a program that presents of biblical truths to children in an accurate and engaging way, providing a tremendous visual grasp of the stories and teachings from the Old and New Testaments. Since 1981, Superbook has been a powerful tool to share God’s Word with the children of the world. Now, with Superbook Academy, your children’s ministry will be equipped and empowered to bring the Bible to life for the next generation in a way that’s accessible, understandable, and entertaining—all at the same time. What is the basic premise of each Superbook episode? Superbook features two friends named Chris and Joy, along with their comical robot, Gizmo. In each episode, they face some type of dilemma to which any child can relate. For example, they are confronted by a bully, they are tempted to cheat on a test, they disobey their parents, or they get lost on a hike. That’s when Superbook takes them back in time to meet a Bible hero who faced a similar type of problem. By seeing how that person faithfully deals with the difficulty, the children are equipped and empowered by God’s Word to overcome their own challenges. In 1981, The Christian Broadcasting Network created a children’s animated Bible series as part of an outreach to the nation of Japan. Little was it realized what impact the series would have in Japan and throughout the world. From Japan, the Superbook series went on air throughout the world from Asia to North America. By 1989, in the midst of economic and political turmoil, Superbook began broadcasting in the Soviet Union to astounding results and aired during prime time on the Soviet National Channel. CBN received over 6 million letters from children, introducing a whole new generation to the Bible. Even today, the Superbook Kids Club is one of the highest rated live-action children’s programs in Ukraine. Since first airing in Japan, the series has now been broadcast in over 100 countries, translated into over 40 languages, and viewed by over 500 million people. This new series is created by an Emmy® Award-winning team whose credits include Disney’s The Lion King, Mulan,and Beauty and the Beast. It has the potential to reach even more lives than the original series with powerful lessons that present spiritual truths and maintains biblical accuracy. What materials are included in each course? Three complete lessons that can be used once a week for Sunday school, children’s church, Bible clubs, or midweek services; three days in a row, such as for homeschool or vacation Bible school (VBS); or even all on one day, for a retreat. Every course features its own Bible story video, Bible Background video, Signpost video, and music videos. Each of the three lessons include easy-to-follow Leader Guides for Large Group, Small Group, and Additional Activities. Each Leader Guide features clear instructions, simple lists of materials, and teaching scripts with class questions and sample answers. New teachers may use the easy-to-follow scripts, while veteran teachers may choose to present the lessons in their own words. Clear teacher instructions, Bible memory verses and ample activities, games and beautifully designed, printable materials. Original professionally produced music videos featuring the Superbook dancers and/or animation from the Bible story, providing children an opportunity to learn to worship the Lord. A Discipleship Challenge that asks children to put biblical principles into practice for all three lessons, helping them become not only hearers but doers of God’s Word. Multi-screen compatible enables you and your students to watch Superbook videos from any connected device—tablets, laptops, smart TVs, and smartphones. Teacher Dashboard that allows teachers to plan, prepare and present lessons from any Internet-connected device on any screen, with no special software to install. Student interaction, with videos promoting class participation through fun quizzes and countdowns, plus Small Group lessons featuring lots of questions and discussions to keep kids engaged. Multilingual options, as Superbook Academy is being translated into other languages. Large Group (for Years 2-7 combined): about 30 minutes. Small Group (for Grades 2-4 and 5-7): about 30 minutes. What is in a Superbook Bible story video? Every Superbook Academy course is based on one Superbook episode. Each animated video features modern-day friends Chris and Joy, along with their comical robot, Gizmo, who face some type of dilemma that any child can relate to. For example, they are confronted by a bully, they are tempted to cheat on a test, they disobey their parents, or they get lost on a hike. That’s when Superbook takes them back in time to meet a Bible hero who faced a similar type of problem. By seeing how that person faithfully deals with the difficulty, the children are equipped and empowered by God’s Word to overcome their own challenge. The Emmy®-nominated Superbook animation videos are broadcast across America and around the world, bringing the Bible to life for the next generation. 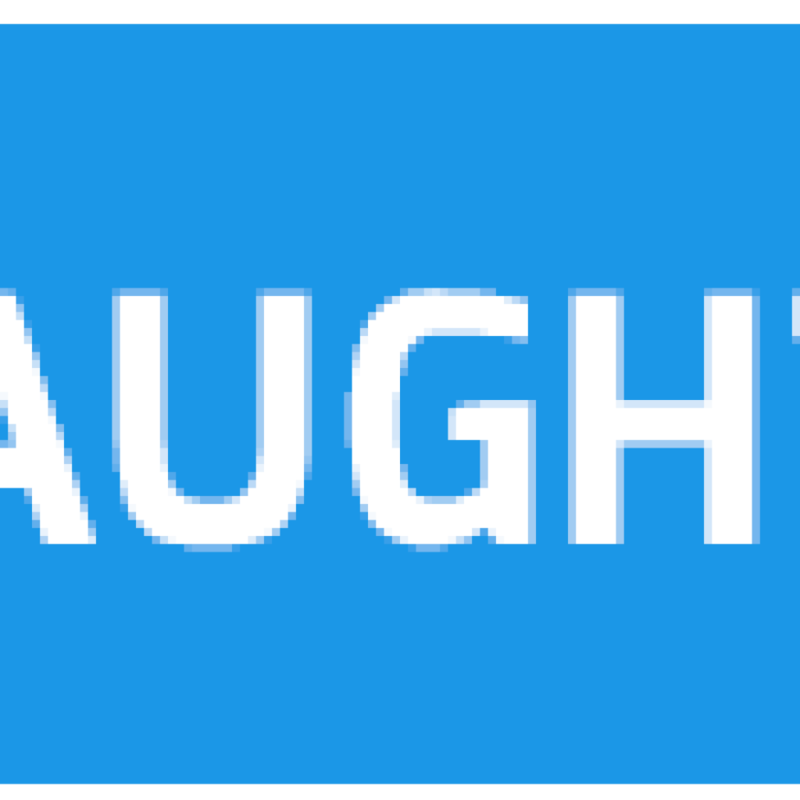 Each video is shown in two sections during Large Group of Lesson 1. The opening dilemma, in which Chris, Joy and Gizmo face a modern-day challenge, lasts about 3 minutes. After a discussion, the full Bible story and resolution is shown, lasting about 19 minutes. A condensed Bible story video (lasting about 10 minutes) is available in each course, to show in Lessons 2 and 3 for any children who missed the full Bible story in Lesson 1. How is the lesson time divided between videos and teaching? Superbook Academy strikes the perfect balance between attention-grabbing media and hands-on ministry. Exciting videos are shown during Large Group to engage and captivate the children, followed by lots of time for personal interaction in Small Group, where teachers develop warm relationships with students as they nurture their faith in Christ. All videos are shown during Large Group, which lasts about 30 minutes. The longest video—the full Bible story video shown during Lesson 1—is about 20 minutes long. All other videos are much shorter, ranging from 2 to 10 minutes in length. These include the Bible Background and music videos shown in Lesson 2, and the Signposts and The Salvation Poem music videos shown in Lesson 3. Plus, the Condensed Bible Story video (about 10 minutes) may be shown in Lessons 2 and 3 if any children missed the full Bible story in Lesson 1. No videos are shown during Small Group, which lasts about 30 minutes and can expand up to 60 minutes with Additional Activities. What Bible versions are used? Superbook Academy primarily uses the New Living Translation (NLT), along with the Contemporary English Version (CEV) and the New King James Version (NKJV). The free Superbook Bible app (http://superbook.cbn.com/app ) and Superbook Online Kids Bible (http://superbook.cbn.com/bible ) both automatically open to the NLT. 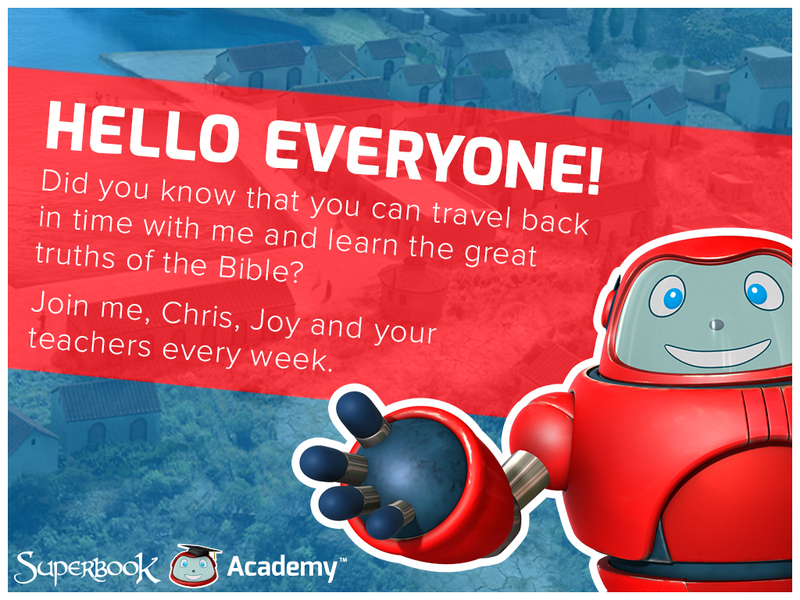 Can I download Superbook Academy church curriculum? Superbook Academy is available instantly through online streaming, rather than downloading. You can stream all of the videos, Leader Guides, and other resources for every course with your subscription. If you need to download Superbook Academy videos for offline use, you can do so using the Vimeo app. Can I edit or customise the Leader Guide? As you preview the activities in the Leader Guides, you may hide the sections you do not want to use so you only see (or print) the sections you wish to include in your presentation. Text within individual sections cannot be edited. Does every classroom need WiFi or a DVD player? All videos on the supplemental DVD for each course are also instantly available for streaming with your subscription. There is no additional material on the DVDs. The supplemental DVDs are available for people to purchase if they do not have WiFi or if they prefer to use a DVD player instead of streaming the videos. Note that the DVDs include videos only, and do not have the Leader Guides, printable crafts, and other supplemental resources that are only available online. Go to Superbook Academy and click Login from the menu, then select “Login”. An email will be sent to you containing a temporary password. How do I enter or update my billing address?